Background – Ben has been folding for four years. He started with ninja stars in third grade. 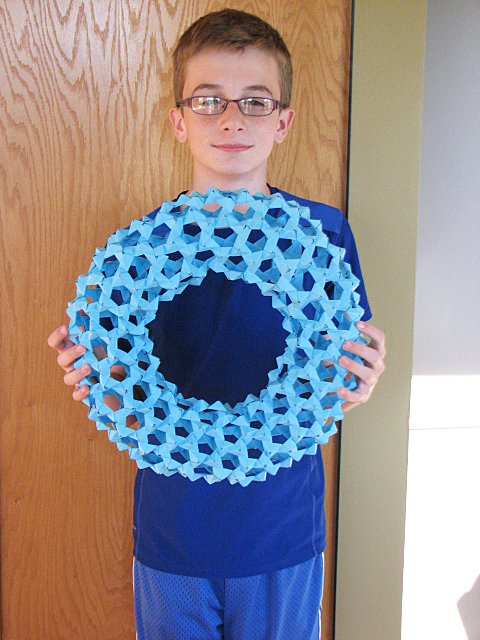 Originally drawn to complex polyhedra, he now is exploring some tessellations, complex animals from one piece of paper, and is still finding many challenges in pieces like the Torus Ring. He owns many origami books and is on the constant lookout for new designs. Please see the attached pictures for some visual representations of his work. How do you choose a project to make with origami? What are the steps you take? Describe why you might pick one project over another. I find a complex model that I like on the internet. Then, I find instructions for it in a book or from a pdf file. Next, I look over the instructions to see if there are any folds I don’t know how to do. If there are, I try to figure them out before I start. What is the most complex project you’ve made with your origami? Describe why it was hard and how long it took you. My most complex piece of origami was an origami Torus Ring. The torus ring is made out of 555 little pieces. The small pieces themselves, weren’t hard. The hard part was connecting the pieces in a fashion so that the module curved. At the time, I couldn’t find any clear instructions on making the curved part, resulting in me taking it apart and putting it back together several times. What projects have you done with your origami that have involved other people? In 5th grade, my friend Aaron had cancer, so I did a project for him. I taught grade levels 3-5 how to make ninja stars. We made around 200 in total and took them to Aaron in his hospital room. We told him to fight like a ninja! I also had a traveling exhibit that started in fourth grade. It took several teachers and the librarians to coordinate the exhibit’s placement at two schools in our district and the public library. The exhibit brought attention to the craft and benefits of origami. It contained many different polyhedra. Do you think origami has helped you to excel in any school subjects? Which ones? Why? In my experience, origami has helped me to excel in math. It has helped me by learning geometric concepts early and by having to do a lot of calculations, as well as recognizing patterns within shapes. Is it difficult to learn origami? How have you learned? It is not that hard to learn origami. You just need to have a good understanding of numbers, be able to follow directions, and be creative. You also need to have a lot of patience and perseverance. How could origami be used to help others? Give examples. Origami can definitely help others. For example, if there is an event for something/someone; it can help create awareness. So, you could make polar bears to raise awareness of the impact climate change is having on polar bears. It can also be used for team building sessions. You have many books on Origami. What are three of your favorites? Why did you choose these three books? My three favorite books include the Robert J.Lang book called Origami Design Secrets (2012) and two of the Vietnam Origami Group (VOG) books. These are my favorite books because the creations are challenging and complex. They also have good directions. Many of the books I own do not really have clear directions. Do you have any advice for people who want to learn origami? My advice includes starting with easier projects. You do not want to jump right to the complex projects. You will need to learn the unique vocabulary that pertains to specific types of folds. If you become frustrated while working on a project you might want to take a break from working on it. I find that even a small break helps reduce my frustration. You’ve started to notice the difference paper quality and other attributes make when creating a piece of origami. Specifically, what have you noticed? If you have a model with lots of layers and steps, you want really thin but strong paper. If you use thicker paper on a complex design, you won’t be able to complete the fold. Name a project you’d like to make but haven’t done yet? I would like to fold the origami ancient dragon or the Ryujin Dragon. However, I haven’t been able to find instructions. I also don’t know if I would be able to fold them, even if I did find the directions. I would try to fold them, if I found good directions. I know that persistence pays off. So, I could keep trying until I got it. What are you working on now, Ben? How is it going? Why did you choose this project? I just started another torus ring. This one is made from four colors, instead of just one. It is going much better than the last torus ring I made, much quicker! I really like making the torus rings. They are one of my favorite projects.